Jio New Happy New Year 2018: 1GB 4G Data Per Day At Rs.149! Jio is the champion of disruptive plans. The new plans offer more data bundled with unlimited calling, SMS and access to Jio apps. Jio has done it again! 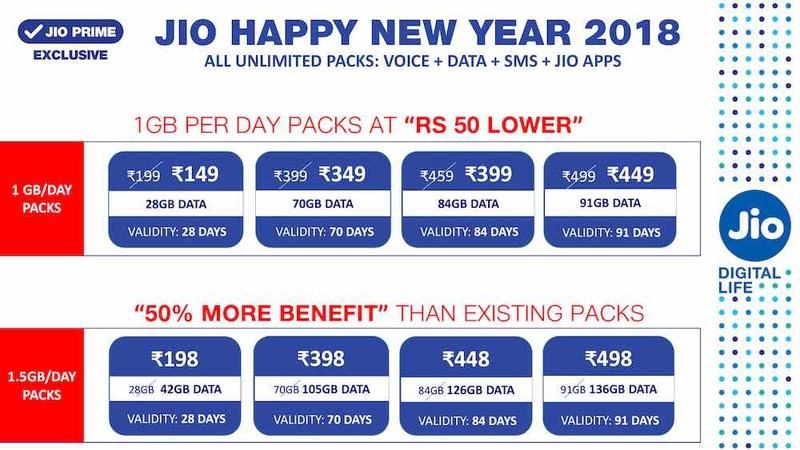 After launching 2 Happy New Year Plans in December last year, Jio is back with a bang with even better Jio Happy New Year 2018 offer. The new offer brings 8 new, updated plans which offer 1GB and 1.5GB of high-speed 4G data per day. All these new plans are unlimited packs with that golden combination of unlimited Voice + Data + SMS + Jio Apps. What this means is that now the lowest plan with 1GB data per day is available at Rs. 149/-! Jio has now 4 updated plans which offer 1GB of high-speed data per day. Previously, the 149 plan offered only 4.2GB data for 28 days and the lowest-priced plan which offered 1GB of daily data was the 309 plan which had a validity of 49 days. The 149 plan will cost Rs. 149/– and will offer 28GB data for 28 days with a daily limit of 1GB high-speed data. The 349 plan will cost Rs. 349/- and will offer 70GB data for 70 days with a daily limit of 1GB high-speed data. The 399 plan will cost Rs. 399/- and will offer 84GB data for 84 days with a daily limit of 1GB high-speed data. The 449 plan will cost Rs. 449/- and will offer 91GB data for 91 days with a daily limit of 1GB high-speed data. Jio is now offering 4 plans with a daily limit of 1.5GB high-speed data. Previously, there were no plans which offered 1.5GB data per day. Jijo has a 199 plan which offers 1.2GB high-speed data per day and a 299 plan which offers 2GB high-speed data per day. Both these plans carry a validity of 28 days. The 198 plan will cost Rs. 198/- and will offer 42GB data for 28 days with a daily limit of 1.5GB high-speed data. The 398 plan will cost Rs. 398/- and will offer 105GB data for 70 days with a daily limit of 1.5GB high-speed data. The 448 plan will cost Rs. 448/- and will offer 126GB data for 84 days with a daily limit of 1.5GB high-speed data. The 498 plan will cost Rs. 498/- and will offer 136GB data for 91 days with a daily limit of 1.5GB high-speed data. Once again Jio has introduced some disruptive plans which are offering good value for money. Their flagship 399 plan now offers 20% more data and an additional validity of 2 weeks, from 70 to 84 days. The 1.5GB per day plans now offer the lowest per GB price of Rs. 4/-. These plans will be available to the people from 9th January 2018. Jio says they have more announcements in the pipeline. So stay tuned for further announcements from Jio. We will keep you updated as and when they happen. Also, let us know which of the above plan appeals the most to you. "Woah! Jio New Happy New Year 2018 Offer: 1GB 4G Data Per Day At Rs.149! ", 5 out of 5 based on 2 ratings.